One story I tell of my childhood—is my parents never went (or took us) to museums. NYC is filled with museums—and many of them are virtually free (you must pay something, but that something can be as little as 1 cent)--but I never saw the inside of them until I started going on my own. But I always point out—museums were the only thing we missed. The UN? We went to the UN headquarters and took the tour so many times, I almost knew the tour guides monolog by heart. The docks? Hardly a ship arrived in port that we didn't visit it, Queen Mary (my mother came to the US on the Queen Mary), the Queen Elizabeth, too, and tons of other ships.. Some Sundays, we drove down the East Side drive past NY hospital-- where I was born-as it was always pointed out. We were reminded , as well, as we drove under the UN headquarters, that technically, we had left the US (and entered international territory!) down to the tip of Manhattan, (and admired the statue of Liberty) then back uptown on the West Side--going at a crawl--to see all the ships in port—back then, there were so many! I clearly remember the day the USS Natilaus (the first atomic submarine ) came to NYC (a pre cursor of the Fleet Week we now celebrate) –because we were all up and out of the house by 8 AM--(and for the most part, we were not a family of early risers!) and while we weren't the first on line to get on board the submarine—we were close. Some where there is photo of me on the deck of the submarine. Niagara Falls? Check. The Capitol? Check. Atlantic City (long before the casino's—I remember going to the Steel Peir and down under the water in the diving bell!) And there were at least two, (maybe more) trips to Indian Point—the local atomic reactor. Back in the day (a very long time ago!) the plant was open to tours... and we took them! I think my parents were slightly in awe—and very optomistic about atomic energy-- because I know I tend to be slightly in awe, and optomistic on the subject. And, as scary as things are now (and they are as scary as Three Mile Island (and less scary then Chernoble) I still retain some of the awe and optomistic outlook. I started out my life—inspite of air raid drills and hiding under school desks—with optomism about atomic energy. I hope I don't have to change my way of thinking before I die. I hope the story of my life doesn't change—for me, and for every one in Japan. 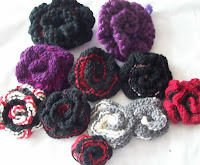 --Oh--Knitting-- The puffy striped sock is onto stripe 2-- and the punk roses are gathering into a small bouquet.